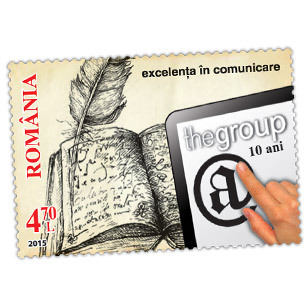 thegroup is Romania’s communication industry market leader. Our mission is professional excellency in offering efficient, innovative, integrate marketing communication solutions. Achieving a leadership position in the media and marketing communication field shortly after its founding in 2005, thegroup has been successful in maintaining this status even after 11 years have passed, helping brands and companies build and develop a strong and lasting reputation. A stamp evokes an element of nobility in the communication between people, it is an universal mark of connection between individuals. A stamp accompanies feelings and offers emotions, it builds bridges and compresses distances; it invites collectors to gather stories with serious inclination and a hint of playfulness and wonder, while granting a symbolic value to the ones it celebrates. The postage stamp issue “Excellence in communication. From tablets to tablet” dedicated to the 10-year anniversary of thegroup, pays tribute to the performance, vision, and professional innovation continuously offered by the founders towards the evolution of an entire field of social sciences.